NEW YORK, NY- April 12, 2016—Gould+Partners, which specializes in PR and ad agency mergers and acquisitions, is pleased to announce the release of “Doing It The Right Way: 13 Crucial Steps For A Successful PR Agency Merger or Acquisition,” by Rick Gould, CPA, J.D., managing partner of the firm that bears his name. The how-to book provides In-depth guidance for how PR agency owners can boost their profitability, enhance their valuations and execute a successful sale. 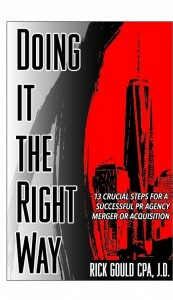 The 13 steps featured in the book run the PR M&A gamut, from what PR owners need to do once they commit to a sale to how to understand the needs of potential buyers to how to structure a sale that’s a win-win for both buyers and sellers. The book also provides guidance on the alternate roles of the CEO and CFO, in the context of a sale, and how to match the vision of the seller with the vision of the buyer. Gould, who shares a wealth of M&A tips and advice, also offers PR agency owners several checklists designed to guide them through the entire process of selling a PR agency. These checklists include types of PR agency buyers, action and business plans, how to build trust, as well as key financial metrics associated with M&As. The book officially will be released in May and will be available via Amazon.com. Net proceeds from this edition of the book will be donated to The Hole in the Wall Gang Camp. Gould+Partners provides consulting services for Public Relations Firms and Digital Media Agencies for increased profitability and is the PR industry source for key profitability benchmarking statistics/insights and successful mergers & acquisitions (M&A) transactions. From our experience gathering and evaluating relevant statistics and insights, we are uniquely qualified to advise and counsel our clients on what is needed to grow and become best in class. Consulting Digital and Public Relations Firms to a new level of success is our specialty and privilege. This is Rick’s Fifth book related to PR firm Management and M&A. Copyright © 2016 Gould+Partners, All rights reserved. The Hole in the Wall Gang Camp…for disadvantaged and seriously ill kids. They experience the world of possibilities that camp has to offer, inspiring them to believe that impossible can be possible. The camp is In Ashford, Connecticut. It was founded in 1988 by actor Paul Newman.